Norwich – Republican gubernatorial candidate Timothy Herbst’s tough on crime platform contains one element that runs counter to federal standards and common practice throughout the U.S. — the complete elimination of a policy that gives inmates the opportunity to shorten their time in prison through good behavior. 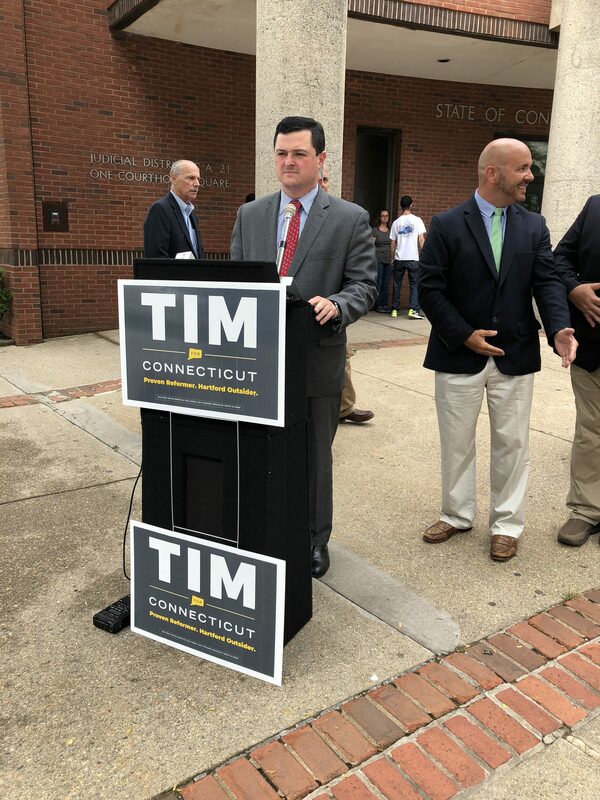 Herbst rolled out his “Six Point Plan to Restore Law and Order to Connecticut” in front of Norwich Superior Court on Thursday morning. In addition to a number of other actions that would undo Malloy-era prison reforms, including reopening the recently-closed Connecticut Juvenile Training School in Middletown, Herbst said he plans to end — without replacing — the governor’s program offering credits for good behavior to inmates, which allows them to be released early from jail. With this elimination, Herbst plans to cut off all avenues for early release, requiring prisoners to serve 100 percent of their sentence unless granted parole without an opportunity to shave off time through good behavior — a strict standard that even the federal prison system does not require. In federal prison, inmates serving at least a year-long sentence may reduce their prison time by up to 54 days per year if they exhibit good behavior, with the exception of felons serving life sentences. The GOP candidate argued that Connecticut’s “early prison release program,” which began in 2011, has opened a floodgate of violent crime in the state, an assertion that runs counter to federal statistics on crime. Herbst said he obtained data from the state Department of Corrections that shows significant violent crime among convicted felons released early through the program. “The program puts Connecticut communities, families and law enforcement officials at risk and must be eliminated,” Herbst said. Connecticut’s “early prison release program” is in line with the majority of states’ earned credit prison policies, allowing inmates of both violent and non-violent crimes to shave off a certain percentage of their sentence by incentivizing them to following the rules in prison. The policies vary across states, however, and good-time credits — or risk reduction credits earned in Connecticut — are founded on research that shows recidivism is highest among inmates who serve 100 percent of their sentence. Similar to federal prison, Connecticut requires that prisoners convicted of violence crimes serve 85 percent of their sentences. Connecticut’s current early release policy is one of the most limiting in the nation, with low-security inmates afforded a maximum of only five earned risk reduction credits per month. Offenders who were convicted of six or more violent crimes are barred from the program. By comparison, Alabama inmates can reduce their sentence by 75 days for every 30 days they serve. Previous Connecticut administrations allowed for inmates serving long sentences to earn up to 15 credits per month. Recidivism rates and violent crime numbers have been, for the most part, on a gradual decline since the inception of the program. But with some inmates leaving prison on good behavior presenting serious danger to communities, the RREC system has drawn widespread criticism from politicians across the board. Herbst cited a few cases during his remarks Thursday, including a January shoot-out between a police officer and an armed robbery suspect who was released from prison early under the RREC program. The suspect was originally in prison for the shooting death of a 17-year old and had a long rap sheet with a history of violence dating back to 2003, including convictions for first-degree assault and first-degree robbery, Herbst said. The former Trumbull first-selectman’s elimination of the Risk Reduction Earned Credit program was just one of six reforms he explained in his plan to crackdown on crime through the implementation of a task force. Herbst with some of his task force members. 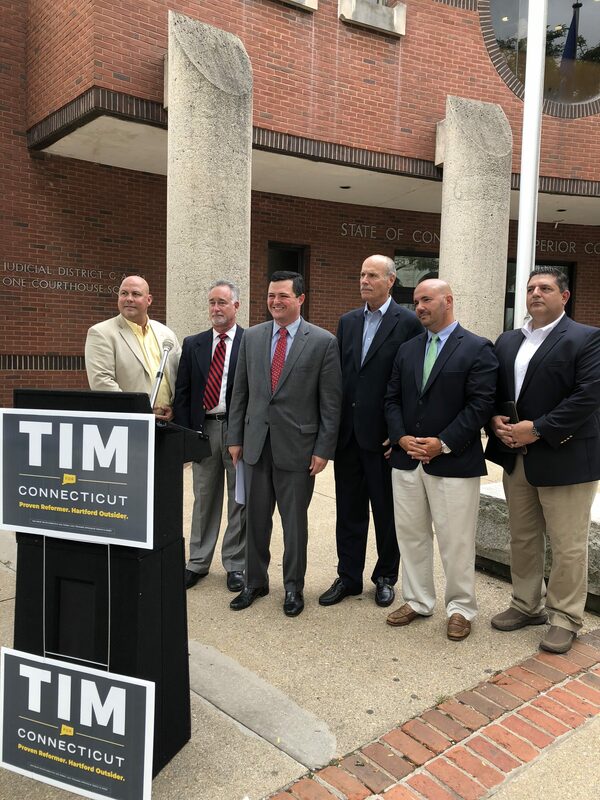 The task force engages a score of politicians, current and former law enforcement officials, and a Connecticut state’s attorney. On the task force are: Mark Tedeschi, a former commander in the Hartford Police Department; David Gulick, Senior Assistant State’s Attorney; Rep. William A. Petit Jr., R-Plainville; Rep. Kevin Skulczyck, R-Griswold, who is a former correction officer; Christopher Lyons, a former commander at the Hartford Police Department; Jim Dicarlo, retired chief of the North Haven Police Department; and Stephen Falcigno Sr., Woodbridge Police Commissioner. Herbst’s plan also proposes increasing funding for law enforcement at local police departments and the Department of Emergency Service and Public Protection, restoring capital punishment in Connecticut, employing a “zero tolerance” policy for sanctuary cities, and cracking down on drug trafficking. He previously has promised to seek the restoration of the death penalty. Finally, his plan calls for an overhaul of the Department of Corrections, including an audit of all correctional programs; requiring statistics and data from the DOC to the Criminal Justice Policy & Planning Division (CJPPD); reopening the Connecticut Juvenile Training School (CJTS) in Middletown, which closed in April; and instituting additional reforms at Whiting Forensic Hospital,including privatizing more staff and services. Herbst said the cost of his program will depend on how far the state chooses to pursue it, however, his plan depends on balancing the state budget through reforms that would dig the state out its debt.